Although you may have lost someone special to you, your memory of them lives on with Gone But Not Forgotten. A list of services provided by Gone But Not Forgotten. A list of flower services in Medicine Hat & Lethbridge. A list of charities in Medicine Hat & Lethbridge. We are deeply saddened to announce the sudden passing of DEE ANNA LEE AKROYD, on Friday, March 8, 2019 at the age of 60 years. Dee Anna will be deeply missed by her mother Liz Akroyd of Lethbridge, AB; fur babies Maddie and Mia; and her sisters Cindy (Rick) Walton of Lethbridge and Wendy (Kerry) Hunka of Calgary; four nephews David, Matt (Macy), Mike (Laura) and Paul (Jackie) and niece Lisandra (Matt). Dee Anna was predeceased by her father Reg Akroyd. She was a loving daughter, sister, aunt and friend who will be missed and fondly remembered. Dee Anna was born on December 1, 1958 in Lethbridge, AB. She worked for the Royal Bank for over 40 years. 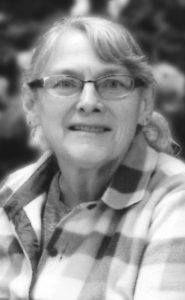 Dee Anna had a love of the outdoors and spent countless time at her second home in Coram, Montana. She enjoyed spending time with her family and friends, knitting, needle point and going on walks with Maddie and Mia. Dee Anna and her family would like to express special thanks to staff of the Foothills ICU Unit C, Dr. Krumm, Dr. Shaw and the nursing staff. A Celebration of Life will be held at CORNERSTONE FUNERAL HOME, 2800 Mayor Magrath Drive South, Lethbridge, AB, on Saturday, March 16, 2019 at 1:00 P.M. I am sadden to hear about the sudden passing of Dee. We worked together for many years at RBC and she was so awesome to work with. She always there for us to answer our questions and she did it all with a smile on her face. Our heart goes out to her Mom, sisters, nieces and nephews. She will be missed. © 2019 Gone But Not Forgotten. Website designed and developed by TriCube Media.